All our local deliveries are made personally by our own drivers. Orders for standard delivery are delivered in the Fleet/Farnborough/Farnham areas the next working day between 9.00am and 5.00pm, or you can specify any working day after that for the same price of £5.99. Check our local area map for availability. All online orders are delivered on this basis and the standard delivery charge will be added when you check out from our online store. If you require a timed delivery window e.g. AM or PM please call to check availability. Orders outside our local area will be delivered through partners in the Interflora network. 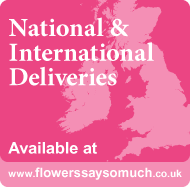 Visit our Interflora website to see the products available for national and international delivery - visit our local area map to find out which area your delivery falls into.